Who would take pride in an ancestor that had been “ejected” from the church he served? Well, after gaining a little more information, I do, and I’d like to share that story of my ancestor, the Rev. William Jack of Dublin, Ireland, with you. First, my Jack ancestors go back over 20 generations to France, the Netherlands, Scotland, and Northern Ireland, almost 700 years of families that we know of. I can’t be 100-percent certain that this man was a great-grandfather, but I know that he was born in Northern France in 1630, and was probably part of the expulsion of Huguenot believers who moved from France to Edinburgh, Scotland, after Catholic Church-State persecution that began in the 17th century. Ironically, King Charles II of England welcomed the French Protestants, and many settled in Ireland. He too would later persecute them for their beliefs and practices. We believe that our William Jack (or Jaques) spoke French and no doubt felt right at home in the Huguenot community of Dublin when called to the ministry there. The cemetery at St. Stephen’s Green there is a reminder today of that earlier French-speaking population. The exact movements of our Jack family are difficult to trace. We know for certain that the first of his nine children was born in Northern Ireland and that by 1661, he was in Dublin. We’ll do our best to follow our Jack line back and forth among the various countries, even to America, later on. Spellings of the surname include “James,” “John,” “Jean,” “Jankin,” “Jacques,” and of course, “Jack.” Some American immigrants even added an “s” to their name, Jacks. This is always a problem for genealogists. See “Introduction: Jack” and “Clearing up Confusion over Names: John & Jack.” While many of the families were large and many, by Scottish naming practices, had the same or similar given names, the our line of Jacks has been well-documented. For example, the 28 journals of Pennsylvania businessman and historian J.V. Thompson (1854-1933) have been transcribed and widely distributed. William Henry Foote’s historical and biographical sketches of North Carolina include the expulsion of Rev. Jack in his lengthy history of our family. Let’s begin with some background on the early Presbyterian Church and more specifically, the Presbyterian Church of Ireland that our Rev. William Jack served. The roots of our church stretch back to the 16th century Protestant Reformation and French theologian John Calvin (1509-1564). A priest and student of his, John Knox (1505-1572), returned to his native Scotland and organized the “Kirk” (Reformed Church) of Scotland in 1560. Among the works by Knox that established the blueprint for this Church were The Scots’ Confession, The First Book of Discipline, and The History of the Kirk of Scotland. Queen Mary, unfriendly to the Reformed faith, was soon replaced by Scotland’s King James VI, who became England’s James I, the sponsor of the famous Bible translation. As he attempted to solve “The Irish Problem” by “planting” English and Scots with the Catholics in Ireland in the early 17th century, Presbyterianism too was transplanted in that new land. But, James I also inspired a series of “Test Acts,” or religious loyalty oaths to the Church of England that stretched into the late 17th century. In 1638, thousands of Presbyterians signed a covenant promising to defend their Reformed faith against Anglicanism and what many felt were compromising their Presbyterian practices. History reports some 18,000 Scots and Scots-Irish, between 1660 and 1689, suffered for “Christ’s crown and covenant.” Known as “The Killing Times,” because so many chose death over submission to Episcopacy, these years became the inspiration for the Covenanter movement, which later came to America with the Scots-Irish immigrants. In 1733, the newly formed Associate Presbytery, or Seceder Church, protested the compromising policies of ministers to the Crown and started new congregations. The earliest Presbyterians in Ireland were ruled and greatly influenced by the Anglicans, the Church of England. Eventually, however, the first presbytery, or formal organization of congregations, was legally established there in 1642, after the arrival of Scottish troops sent to quell an Irish rebellion. By 1660, a third of all Protestants there were Presbyterian, about 100,000. Within 30 years 100 congregations under five presbyteries were operating. Despite these numbers, Presbyterians were excluded from civil, military, and municipal employment until 1679. Marriages by these Church ministers were not recognized until ten years later with the Toleration Act of 1689. The story of the founding of the Presbyterian Church in our country during these years is truly inspirational. The Rev. Francis Makemie (1658-1708) is credited with this movement in 1706, which has all the elements of democracy and freedom of religion in the New World. Interestingly, Makemie was licensed in the Lagan Presbytery, under which our William Jack served, and introduced by Thomas Drummond, one of the thirteen pastors ejected along with Jack from the Irish presbytery in 1661. Before Makemie, the Presbyterian adherents and Congregationalists in America had been led by lay elders. Robert Wilson of Strabane; William Moorcraft of Newtonstewart; John Wool of Clondermot; William Semple of Letterkenny; John Hart of Taughboyne; John Adamson of Omagh; John Crookshanks of Raphoe; Thomas Drummond of Ramelton, Donegal; R. Robert Craighead of Donoughmore, Cork; Hugh Cunningham of Ray; Hugh Peebles of Lifford; R. Adam White of Fannet, Donegal; and our William Jack of Bull Alley, Dublin. There came a black cloud over this poor Church [Presbyterianism]; for the old enemies became bitter and triumphed over the ousted ministers that they might get some advantage over them. Yet, as the danger and difficulty of the time allowed, they did visit the people from house to house, and sometimes had small meetings of them in several places of the parish in the nighttime. Before we consider William Jack’s future after the ejection, let’s look at the fate of several other of the Lagan pastors. First, Robert Wilson of Strabane was the grandfather of the 28th American president, Woodrow Wilson. William Semple of Letterkenny (c.1620-c.1690), was the son of Sir William Semple, a Lord. Apparently in a rage from his pulpit, the younger Rev. Semple is quoted as declaring that meeting place “accursed” through being “the cause of the loss of so godly a minister as they formerly had, since which time they had gone astray like lost sheep.” One wonders what Semple’s replacement must have said after him ejection. Who for Christ’s interests did appear. Of Christ their King, His noble cause. Robert Craighead (1633-1711) was born in Scotland but pastored in Ireland for 30 years. 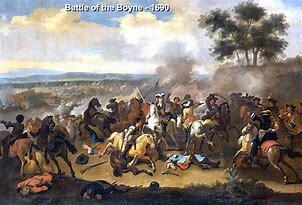 Just before the Catholic troops threatened the Protestant future King William III at the Battle of Boyne in 1690, Craighead moved his ministry north to Londonderry. There, he escaped the historic siege of the city by the forces of James II and sailed to Glasgow, back to his homeland. There, again with family and friends, he was well received and published several volumes for believers. Before his death in 1711, he returned to Ireland to minister again in Derry. Adam White (1627-1708) was also born in Scotland. Records from the University of Glasgow show he matriculated in 1645 with “studies in Greek, followed by Logic, Ethics, and finally Physics.” He obtained a Master of Arts in 1648. After an apprenticeship, probably as an assistant to an ordained minister, he himself was ordained in the Presbyterian Church at Fannet, County Donegal, in 1654 at age 27. White’s first salary was 100 pounds per year, roughly $100, or $2 per week by today’s standard. After serving only seven years, he accepted deportation with his ejection. However, he continued to minister and was eventually excommunicated and imprisoned with three other ministers for seven years. The King himself ordered their release, it is said, because he had sympathy for their willingness to suffer for their principles. History says that he was reinstalled to the ministry in 1672. He served in Tyrone until returning to Scotland in 1688. Within a year he returned to Ulster for the final time to serve at Bush Mills, Antrim, until his death there in 1708. What do we know about William Jack and his church at Bull Alley, Dublin? Well, very little specifically of Rev. Jack, but in returning to his arguable family history, we see that by 1657 and the birth of the couple’s third child, they were living in Londonderry. We don’t know where the Rev. Jack studied or when he was ordained, but he was licensed to preach by the Lagan Presbytery and had moved south to Dublin by 1660. His timing couldn’t have been worse because the next year he and many other Presbyterian ministers would be removed from their pulpits. Family historians believe that in 1661, the year the couple’s fourth child was born, Jack went back to Edinburgh. From there his whereabouts are unknown. 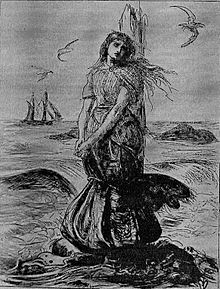 Incidentally, that fourth child, David, eventually sailed to the New World, specifically Virginia. We haven’t found anything on the rest of the children, except that David’s brother Jacob, who married three times, left Edinburg for Pennsylvania and Maryland with at least two of his 15 children. We know that William’s oldest grandchild, Capt. Patrick Jack, Sr., lived in Chester County, PA, near Philadelphia. This was where the family split, with some children, including our line, moving to Western Pennsylvania, and others to North Carolina. Perhaps the most notable Jack in American history was Capt. 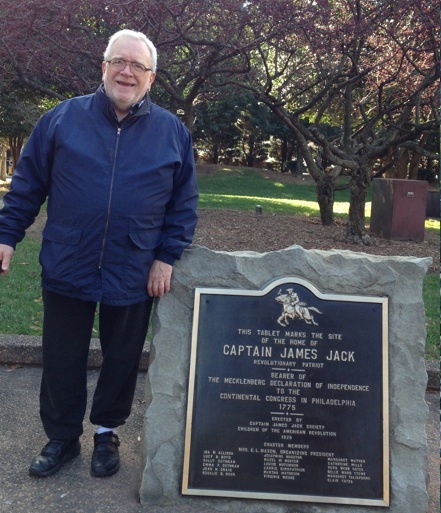 James Jack, William’s great-grandson, who delivered the “Mechlenberg Declaration of Independence” by horseback from Charlotte to the Continental Congress in Philadelphia in 1775. Unfortunately, his brother James Jack, Sr., also a captain in our line, is not without controversy. He had served in the Northern Ireland Militia, County Down, at the time of persecution of Protestants by Roman Catholics. He may have been deported to the Americas as a “convict” sometime in 1769. He appears on a US/Canada Immigration List index in 1769 as a “convict” and is listed as an “inmate” in 1770 US Census records in East Caln, Chester County, Pennsylvania. One source has him serving in the American Revolutionary War later, but his son, Capt. James, Jr., also our line, is believed to have died fighting in the war. So, all of that doesn’t tell us much about the Rev. William Jack himself, but it does point to the resolve in our Jack family to fight oppression. Let’s turn now to the Rev. Jack’s congregation in Dublin. A quick internet search of the Bull Alley Church reveals, not to our surprise, that the building at the original site is long gone. 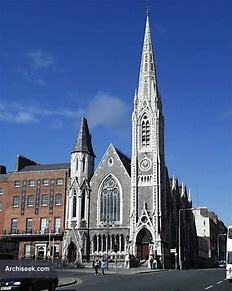 However, before the formation of the first church, Presbyterians had long played a prominent part in Dublin’s history. In 1594, the Rev. William Travers was appointed as the first Provost of Trinity College. Two of the first fellows at the university were also Presbyterians. The Bull Alley church, named for the lane running along what is now St. Patrick’s Park, was established before 1660 under the ministry of, according to one source, Rev. William “Jacque.” After a long useful life, the Bull Alley church was demolished in 1882. 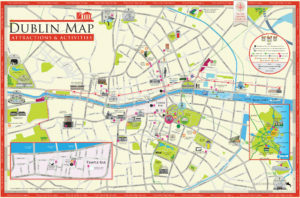 In over 350 years, a series of moves and mergers by the Presbyterian congregation in Dublin included the names “Ushers’ Quay” [probably named for the owner of a pier for loading and unloading boats], “Ormond Quay,” “Scots’ Church,” and “Clontarf” [ironically, meaning “meadow of the bull” in Gaelic, which is located just north of city center]. One of the sanctuaries was destroyed by fire during the tragic Easter Uprising of 1916 but rebuilt. 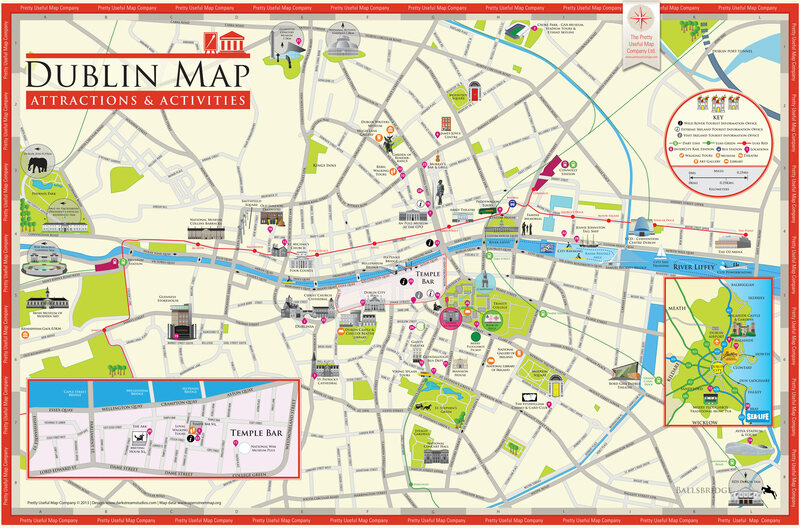 Bull Alley is now called Bull Alley Street (see first map) and is part of Dublin’s friendly shopping district. In 1938 the church moved to Abbey Street on Dublin’s north side, an area rich in history. Ireland’s national theater is there, and the remains of a Catholic convent. It is said that “St. Mary’s” Abbey was originally founded by Godfrey, a Danish king, in 948 AD. The Cistercian order occupied it at some point, but left in 1641, making room for the Presbyterians. Today, the evangelical church has 300 members from all over the city with ties to the Anglican, Methodist, and Roman Catholic persuasions. They take pride in student exchanges with sister Presbyterian churches in the North. The Abbey Church is home to Meals on Wheels, Alcoholics Anonymous, youth groups, and more. In fact, in recent years, several women have been ordained out of the parish, with several more finishing their studies. Research continues on our ancestor, William Jack, but in understanding and summarizing the history of our faith in Ireland, we know that the three kings disfavoring the Presbyterian Protestants, Charles I and II and James II, grew increasingly alarmed by the opposition to their interference in the non-conforming church. First, there was the Presbyterians signing of Scotland’s National Covenant in 1638 and then the Solemn League and Covenant in 1643. Then the pledges were brought to Ulster for signing. 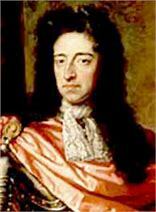 In 1688, William of Orange (William III 1650-1702), a Protestant, deposed Charles II in 1688 in what was welcomed as The Glorious Revolution. William took the throne once and for all after military success at the Battle of the Boyne in 1690 and restored practical freedom of religion, which became official with the Toleration Act of 1719. Ireland’s tenant farmers, however, continued to suffer economically and politically with mandatory tithes to the Church of Ireland. The land that they thought they owned was seized and awarded to the “landed gentry.” For almost 150 years the Synod of Ulster saw tensions among the Calvinists: the conservative “Old Lights,” strong adherents to the Westminster Confession of Faith, and the “New Lights,” more liberal, numerous, and free-wheeling. By the 19th century some even formed a new non-subscribing body, the Remonstrant Synod. Nevertheless, the conservative Seceders and Covenanters made their presence felt. But by 1840, subscription to the Westminster Confession became mandatory, and after what has been called the Ulster Revival of 1859, missionary outreach at home and abroad became a unifying practice. The Presbyterian Church, as a whole, in Ireland today has some 300,000 members in 540 congregations, 96% of which can be found in Northern Ireland, the second largest denomination there after Roman Catholicism. The largest Protestant body is the Church of Ireland, or Anglican. They enjoyed the painful though honorable pre-eminence of being the first to suffer in three kingdoms. They are, therefore, eminently entitled to the admiration and gratitude of posterity. They set an example of fortitude and integrity which prepared and encouraged their brethren in the sister kingdoms to act with similar magnanimity, and thus conjointly exhibited to the world a convincing and instructive proof of the power of religion and of conscience unparalleled in the annals of the Church’s history. There [in Ireland], faithful men, indeed, not only at first replanted the Presbyterian Church in the Province, and, under God, “caused it to take deep root and fill the land,” but when “her hedges were broken down” and her enemies exalted over her destruction, supported by “the right hand of the Lord,” they carefully repaired the breaches and up-reared her shattering stem, watering it with their prayers, till “the hills were once more covered with the shadow of it, and her boughs were sent out to the encircling sea.” Let the names, therefore, of these righteous men be held in everlasting remembrance. Indeed. the branches of that Irish tree of faith reached across the ocean to the New World, and replanted itself again, with God’s help, as the foundation of the greatest democracy on earth. We hope you’ll take the time to read more about our Jack family at this site, including its storied ancestors such as the Rev. William Jack. William Henry Foote. Sketches of North Carolina: Historical and Biographical, Illustrative of the Principles of a Portion of Her Early Settlers. New York: Robert Carter, 1846.